Guadeloupe is an archipelago located in the eastern Caribbean Sea, with a land area of 1,780 square kilometers, ten times the size of Washington, D.C.. Geologically, it is very diverse, ranging from high mountains to flat plains. Tourism is the major source of Guadeloupe's economy, though a substantial amount of its income comes from the spending of the French governmental salaries, as well as grants from that nation. The southern coast of Grande-Terre is popular for its white sand beaches, while Pigeon Island in Basse-Terre is best known for snorkeling. The volcano of La Soufrière is a popular destination, as are the many beautiful simple trails abundantly flowing with diverse flora and fauna. Slave labor brought from Africa to work the sugarcane fields in the seventeenth and eighteenth centuries, and later servants from India and China, have resulted in a unique mixed culture known as Creole. Guadeloupe was colonized by France and is an overseas department of that nation. As part of France, Guadeloupe is a member of the European Union and its currency is the euro. There have been numerous attempts at autonomy since the Second World War, though none have been successful. Guadeloupe's economic dependence upon France binds the two. Guadeloupe is a group of islands situated among the Leeward Islands or the Lesser Antilles in the Eastern Caribbean Sea and comprises five islands: Basse-Terre, Grande-Terre, Désirade, Les Saintes, and Marie-Galante. Further to the north, Saint-Barthélemy and the French section of Saint Martin once belonged to Guadeloupe. However, on December 7, 2003, both of these areas voted to become an overseas territorial collectivity. The neighboring islands to Guadeloupe are Antigua to the north, Montserrat to the northwest, and Dominica to the south. 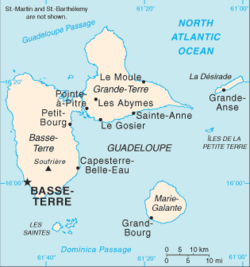 Guadeloupe's political capital is Basse-Terre located in the southwestern coast of Basse-Terre Island. The largest urban town in Grande-Terre is Pointe-à-Pitre. Guadeloupe's two largest islands, Basse-Terre and Grande-Terre, are similar to the shape of a butterfly and are divided by a narrow mangrove channel called Rivière Salée. Basse-Terre, the western island, is mountainous and volcanic; its highest peak, La Soufrière 4812 ft (1467 m), erupted in the eighteenth and nineteenth centuries and is still active. Grande-Terre, the eastern island, is flat and is composed of limestone on its outer surface due to the island being submerged under water in earlier geological periods. Marie-Galante and La Désirade, flat dessert-like islands, are also of limestone composition. 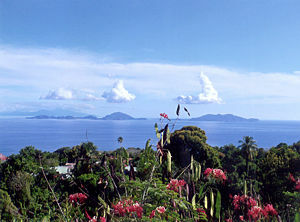 Les Saintes is comprised of eight islands, only two are inhabited: Terre-de-Haut and Terre-de-Bas Les Saintes' typical landscape is composed of volcanic hills and deep bays. Guadeloupe's mean temperature on the flatter islands is 88°F (31°C); at the higher elevations it is 74°F (23°C). Basse-Terre Island is cooler and rainier than Grande-Terre. The names of the islands come from the description of the winds that blow over the terrain, not the terrain itself. Thus, the small and flat eastern island is named Grande-Terre which means "big island," while the western, mountainous island is named Basse-Terre which means "flat island." Guadeloupe's vegetation is very diverse due to its topography. Basse-Terre is a contrast of bamboos, mangrove swamps, and abundant forest trees, such as gums and chestnut trees. The forest has thick fern, flowering heliconia, and ginger plants. The main birds found in Guadeloupe are pelicans, hummingbirds, and the endangered Guadeloupean wren. 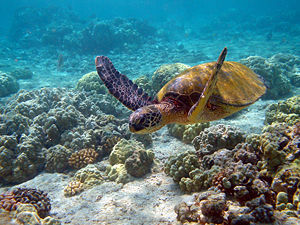 Two other endangered species are the green sea turtle, and the leatherback turtle. There are raccoons, mongooses, agoutis and iguanas. Guadeloupe was first settled by Arawak Indians from Venezuela about 300 B.C.E., who fished and developed agriculture on the island. Carib Indians, also from Venezuela, pushed out most of the Arawak in the eighth century. They also subsisted on agriculture and fishing. The Caribs renamed the island "Karukera" or the "Island of beautiful waters." Guadeloupe was discovered by Christopher Columbus on his second trip to the Americas in 1493. He called it "Santa María de Guadalupe de Extremadura," after the image of the Virgin Mary venerated at the Spanish monastery of Villuercas, in Guadalupe, Extremadura. The Spanish made two attempts to settle Guadeloupe in the 1500s, but because of the fierceness of the Caribs the Spanish abandoned their claim to the islands. After three decades, the French American Islands Company delegated Charles Liénard and Jean Duplessis, Lord of Ossonville, to colonize one or any of the region’s islands, Guadeloupe, Martinique or Dominica. Due to Martinique’s inhospitable nature, they settled in Guadeloupe. The French took possession of the island on June 28, 1635. They drove out many of the Carib Amerindians, planted crops and built the first sugar mill. By 1674, Guadeloupe was annexed to the Kingdom of France and a slave-based plantation was established. Over the next century, the island was seized several times by Great Britain, the first time between 1759 and 1763. During this time Pointe-à-Pitre was developed into a major harbor enabling planters to export sugar and import North American lumber and food. Many French colonists actually grew wealthier under the British occupation and the economy expanded rapidly. Another indication of Guadeloupe's prosperity at this time was that in the Treaty of Paris (1763) France, defeated in war, agreed to forfeit its territorial claims in Canada in return for British recognition of French control of Guadeloupe. In 1790, the upper classes of Guadeloupe refused to obey the new laws requiring equal rights for the free and attempted to declare independence, resulting in great disturbances. A fire broke out in Pointe-à-Pitre and devastated a third of the town. A struggle between the monarchists (who wanted independence) and the republicans (who were faithful to revolutionary France) ended in the victory of the monarchists, who declared independence in 1791. This was followed by their refusal to receive the new governor appointed by Paris in 1792. Because of Hugues' attacks on American ships, American interests were threatened, creating tension between Napoleonic France and the United States, ultimately resulting in the U.S. canceling formal alliances with France, and caputing French ships, known as the Quasi War. French president Napolean Bonaparte responded by sending General Richepance to Guadeloupe to put a stop to the murder spree, and restore the institution of slavery, which would remain in place until 1848. A group of 26 antislavery forces led by Louis Delgrès were trapped on the slopes of Matouba Volcano. When it became obvious that the invading troops would take control of the island, some blew themselves up rather than surrender, leaving a legacy of heroism remembered to this day. The occupation forces killed an estimated 10,000 Guadeloupeans (about ten percent of the population) in the process of restoring order to the island. Richepance then re-established slavery. In 1810, the British once again seized the island and held it until 1813, when it was ceded to Sweden as a consequence of the Napoleonic Wars. Sweden already had a colony in the area, but only a year later Sweden left the island to France in the Treaty of Paris of 1814. French control of Guadeloupe was finally acknowledged in the Treaty of Vienna in 1815. Slavery was abolished on the island in 1848 at the initiative of Victor Schoelcher. Once the African slaves were permanently emancipated, the plantation owners on Guadeloupe faced terrible economic hardships, being forced to pay wages to their workers. Workers from China and India came in to replace the freed African slaves. and having to pay these workers for their efforts helped to cause the economic downfall of many planters on Guadeloupe. Several planting estates, no longer profitable without slave labor, were bought out by foreign companies in the late nineteenth century. Since World War II there have been several independence movements. Charles de Gaulle, while visiting the islands in 1956, 1960, and 1964 was successful in convincing the majority to remain within the French Union. Local control has gotten stronger since the 1960s, however, during stagnated autonomy talks during the 1970s, the separatist groups became increasingly violent. Though there continues to be talk of autonomy, France remains determined to hold Guadeloupe in department status. The harsh economic conditions on Guadeloupe caused much social unrest, and several revolts and strikes by workers occurred during periods of economic depression. In response to Guadeloupe's stagnating economic situation, island officials began to diversify the economy so the region wouldn't be forced to rely only on growing sugarcane to survive in the marketplace. Sugarcane, in fact, lost its profitability due to high labor costs. Since the 1950s, farmers on the island began producing crops such as pineapples, bananas and rice to subsidize the economy. Today, bananas, rum and sugar are still Guadeloupe's main exported products. In green (with red legend) are the former constituent parts of the Guadeloupe region/department among the Leeward Islands. 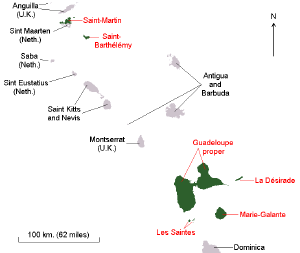 On February 22, 2007, Saint-Martin and Saint-Barthélemy seceded from Guadeloupe, but Marie-Galante, La Désirade, and Les Saintes are still part of the Guadeloupe region/department. 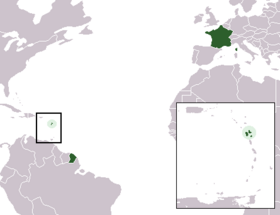 Guadeloupe became an overseas department of France in 1946, and as such, is part of the European Union. Its head of state is the President of the French Republic, who appoints a Prefect (resident at the Prefecture building in Basse-Terre) as his representative. It honors the French Constitution of September 1958, and utilizes the French legal system. Guadeloupe is represented in the French parliament by two senators in the French Senate and four deputies of representatives in the French National Assembly. The legislative branch is composed of a unicameral General Council and a unicameral Regional Council. The judicial branch is composed of two courts: A Court of Appeals and an Assize Court, used for the settling of felonies. These courts are located in Basse-Terre with jurisdiction over Guadeloupe, French Guiana, and Martinique. There is no regular military force in Guadeloupe. Defense is the responsibility of France. There are two arrondissements: Basse-Terre and Pointe-à-Pitre. Pointe-à-Pitre arrondissement consists of Grande-Terre, La Désirade, Marie-Galante Island, and Îles de la Petite Terre. 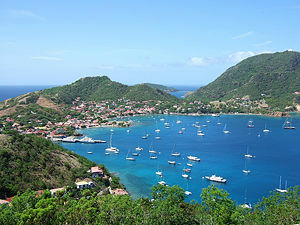 Basse-Terre arrondissement consists of Basse-Terre, and the Îles des Saintes. There are 40 cantons. The economy of Guadeloupe depends on tourism, agriculture, light industry and services. It also depends on France for large subsidies and imports. Guadeloupe was once primarily dependent on the growth and exportation of sugarcane, but when the sugar market became less profitable, the island was forced to concentrate its efforts on other cash crops such as bananas, which bring in approximately 50 percent of the island's export earnings. Other moneymakers in the agricultural industry include crops such as eggplant, coffee, cocoa, pineapples and many varieties of flowers which are grown along the island's coast. Other local crops are guinnep, noni, sapotilla, paroka, pikinga, giraumon squash, yam, gourd, plantain, christophine, monbin, prunecafé, jackfruit, and pomegranate. Rum production and exportation is also part of Guadeloupe's agricultural economy. Many of the region's self-sufficient residents grow their own small crops for their families. Most manufactured goods, such as foods, fuels, vehicles, clothing, and construction materials are imported, mainly from France, but from other countries as well. Unemployment is especially high among the young. Hurricanes periodically devastate the economy. Tourism is the main economic industry on Guadeloupe. Most tourists who visit the island come from the United States, but travelers come from all over the world to enjoy the beautiful beaches and experience all that this island has to offer. The number of cruise ships that dock on the island's port has been increasing in recent years, making cruise ship tourism a growing market. 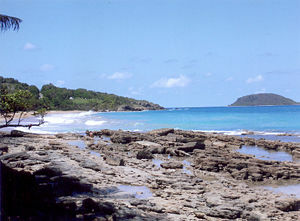 A popular destination is the southern coastal beaches of Grande-Terre, in Gossier, Saint-Félix, Sainte-Anne, or further to the east Saint-François. Mountainous green forests and ocean views line the way to Basse-Terre, the home of the Volcano La Soufrière and Carbet Falls. Pigeon Island is Guadeloupe's most popular snorkeling location. Guadeloupe Pole Caraïbes Airport, north of Pointe-à-Pitre, is an international airport used by French, U.S., Canadian, British, and Dutch airlines. France has the best air connection with Guadeloupe, with several local and international carriers flying directly between Paris and Point-à-Pitre. Canadian and American travellers can fly directly on Air France or Air Canada; those taking other carriers must connect at San Juan, Puerto Rico. Several carriers fly between Guadeloupe and other Caribbean islands: Air Martinique and Air Guadeloupe fly between Pointe-à-Pitre and Fort-de-France on Martinique, while Antigua-based LIAT connects Guadeloupe with the English-speaking Caribbean. There's no departure tax. There is a secondary airport on Marie-Galante, and five more small airports in the other islands. Flying between the islands is faster but not necessarily more convenient. Air Caraïbes has daily flights between Pointe-à-Pitre and Marie-Galante, La Désirade and Terre-de-Haut. The port of Pointe-à-Pitre is equipped to handle cargo of minerals, sugar, and cereals. The port of Basse-Terre specializes in the banana export trade. Getting between Guadeloupe and its associated islands is easiest by ferry. There's service between Pointe-à-Pitre and Les Saintes, Saint-François, Trois-Rivières and Marie-Galante. There are also ferry routes between Saint-François and Marie-Galante and La Désirade. Guadeloupe has a good public bus system that operates from early morning to early evening, with fairly frequent service on main routes. On Sunday, service is much lighter and there are no buses on most secondary routes. Taxis are plentiful but expensive. The road system on the main islands is kept in excellent condition. Except for some privately owned plantation lines, there are no railways in Guadeloupe. Vehicles drive on the right. Traffic rules and signage are the same as in France. Bicycles, scooters and motorbikes are also an option, but given the unfamiliar terrain and the volume of traffic in Guadeloupe, two-wheel riders are recommended only for the most experienced. Motorcycles can be fun on Terre-de-Haut and Marie-Galante, since there are few autos on the road. French is the official language of instruction. In addition to primary schools, there are secondary schools as well as a teacher-training colleges. A school of humanities, a law and economics school, a school of medicine, and a school of science at Pointe-à-Pitre are part of the University of the Antilles and Guyana. Many students pursue higher education opportunities in France, which is economically feasible only to a few, due to Guadeloupe's national status. Guadeloupe has a 90 percent literacy rate. Guadeloupe's estimated population is 453,000 (July 2006 est. ), most of whom live in Basse-Terre (est. over 200,000) and Grande-Terre (est. over 200,000). About 3,000 people live in Les Saintes, 1,600 on La Désirade, and 13,000 on Marie-Galante. The majority of the islanders speak French, which is the official language. A local creole dialect, patois, is also widely used. Ninety percent of the population is literate. French censuses do not record ethnicity, so estimates of the percentages of Guadeloupe ethnic composition vary. Guadeloupeans are primarily of African heritage from the Guinean coast mixed with some French ancestry. According to the CIA Worldfactbook, July 2006 estimates were Black/Mulatto at 75 percent of the population, white at 11 percent, Tamil and East Indians at 9 percent, Lebanese and Syrians at 3 percent; while Chinese and 'other' composed 2 percent of the population. There are small numbers of immigrants from various Caribbean islands, mainly from Haiti and Dominica. The majority of Guadeloupeans, 91 percent, practice Roman Catholicism. Five percent are Protestant Christians, while two percent are Jehovah's Witnesses. The remaining four percent belong to the Hindu or African animist faiths. Guadeloupe's culture is a mixture of African, French, East Indian, and Caribbean influences. The mix is visible in the architecture, which varies from French colonial buildings to Hindu temples; in the foods - a mixture of which, originating from various cultures, makes the island food a unique Creole cuisine; and in the widely spoken local Creole language. 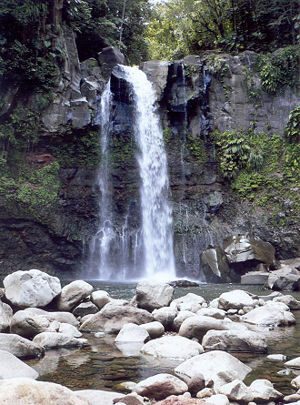 Guadeloupe's culture is probably best known through the islanders' literary achievements, particularly the poetry of Saint-John Perse, the pseudonym used by Alexis Léger. Perse won the 1960 Nobel Prize in Literature "for the soaring flight and the evocative images of his poetry which in a visionary fashion reflects the conditions of our time." Other important literary contributions are produced by many living writers, poets, novelists, essayists and journalists, among them Maryse Condé, Ernest Pépin and Simone Schwartz-Bart. Music and dance important to Guadeloupeans and widely accepted as an interaction of African, French and Indian cultures. Its musical heritage is intertwined with that of its sister island, Martinique. Despite their small size, the islands have created a large popular music industry, which gained in international reknown following the success of zouk music in the later twentieth century. Zouk's popularity was particularly intense in France, where the genre became an important symbol of identity for Martinique and Guadeloupe. Zouk's origins are in the folk music of Martinique and Guadeloupe, especially Martinican chouval bwa and Guadeloupan gwo ka and the pan-Caribbean calypso tradition. Many international festivals take place in Guadeloupe, such as the Creole Blues Festival, the Marie-Galante Festival, and Festival Gwo-Ka Cotellon, to name a few. Many Euro-French forms of art are also omnipresent in the melting pot. Another element of the Guadeloupean culture is its dress. Women in particular have a unique style of traditional dress, with many layers of bright, colorful fabrics, now worn mainly on special occasions such as festivals and cultural events. On festive occasions the women wear a head scarf tied in a variety of symbolic forms. Jewelry is also important, mainly of gold, in the Guadeloupean lady's dress, a product of European, African and Indian inspiration. Also culturally important are the arts, particularly painting and sculpture. Famous painters and/or sculptors include Michel Rovelas, Claudie Cancellier, Jean-Claude Echard, Christian Bracy, Roger Arekian, les Frères Baptiste, Michelle Chomereau-Lamothe, Léogane, Pédurand, Nicole Réache, Victor Sainsily. Football (soccer) is popular in Guadeloupe. Thierry Henry, a star of the French National Team and Spanish League club FC Barcelona, often visits, as his father Antoine was originally from the island. Lilian Thuram, a star football defender for France and FC Barcelona, was born in Guadeloupe. The French national team and Manchester United striker, Louis Saha, is also of Guadeloupean descent as is Swansea City goalkeeper Willy Gueret. The region's football team also experienced success in advancing to the 2007 CONCACAF Gold Cup semi-finals, where they were slightly defeated 1-0 by CONCACAF powerhouse, Mexico. Many valuable track and field athletes, such as Marie-José Perec, Patricia Girard-Léno and Christine Arron, are also Guadeloupe natives. ↑ Pointe-à-Pitre. French language, Ville de Pointe a Pitre, Retrieved July 28, 2017. ↑ Ben Cahoon, Guadeloupe, World Statesmen.org. Retrieved July 28, 2017. ↑ Office of the Historian, Treaty of Paris (1763). Bureau of Public Affairs, United States Department of State. Retrieved July 28, 2017. ↑ James Chastain, Victor Schoelcher, Encyclopedia of 1848 Revolutions. Retrieved July 28, 2017. ↑ Nobelprize.org, The Nobel Prize in Literature 1960. Retrieved July 28, 2017. This page was last modified on 28 July 2017, at 19:34.